A rough weekend got rougher. Got sick this weekend. Must have been something I ate. Sick Saturday, sicker Sunday, and began feeling better Monday. Oh, not our house. But a family member who lives across the street. The Wife's sister, her husband, and their two children came home yesterday afternoon to find their house filled with smoke and flames. The area fire departments (mostly volunteer) responded and saved the structure. That is, there appears to be no damage to the roof, and the fire was contained to the central area of the house. There was extensive smoke and water damage. Not sure how much is salvageable. Their three inside cats weren't; they were found dead from the smoke. And all their clothes, furniture (the furniture that didn't burn, that is), and many other items will probably not be salvageable. Despite the fact they contained the fire to a relatively small area, smoke and heat were all throughout the house. Then the water damage from the fire departments' efforts to put out the fire. 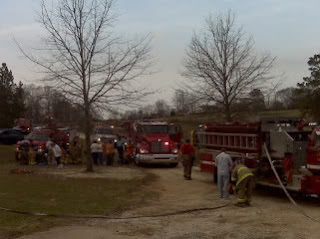 I must commend the local fire departments as well as the sheriff's office for their quick response, care, and concern. According to the investigators with the fire and sheriff's office, it looks like the fire began at the phone jack by the computer. Not the electrical outlet, which was several feet away, but at the phone jack. Last night was recovering what could be: photos, baby books, family mementos... Then running to the store for clothes and basic necessities. And food; the fire came right before supper. We'll see how the rest of the week goes. As far as the rest of the week, Vegas puts the line at 100:1 that it cannot get worse. I'm so sorry, Basil. What a tragedy. I hope they're able to get back on their feet soon. We'll be thinking of you all. I'm just catching up with your blog and saw this horrible news. I've got some used furniture in a storage place over in Columbus and if your kin needs it, I'd be happy to help out.